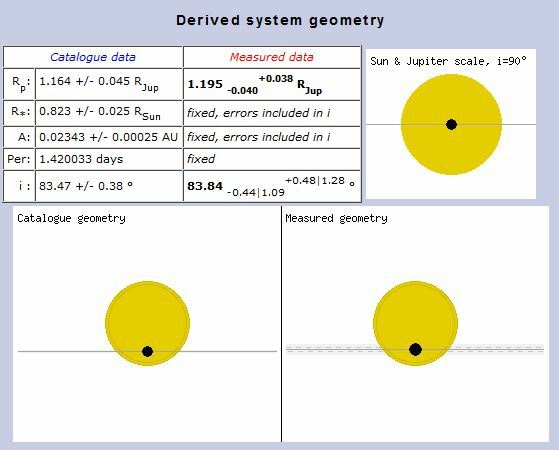 Qatar-1b is a gas-giant planet, 1.1 times more massive than Jupiter and with a diameter 1.2 times that of Jupiter. It orbits an orange dwarf star (named Qatar-1 in honour of the discovery, catalogue number 3UC311-087990) which is located 170 parsecs (550 light-years) from Earth in the northern constellation of Draco. At this distance, the host star appears about 200 times fainter than the faintest stars visible to the unaided human eye on a clear moonless night. The planet’s distance from its host star is just 0.023 times the Earth’s distance from the Sun. It completes a full orbit every 34 hours. Although the host star is smaller and about 800C cooler than the Sun, the planet’s close proximity gives it a searing day-side temperature of 1100C. Here are the estimated planet parameters deduced from the transit data.